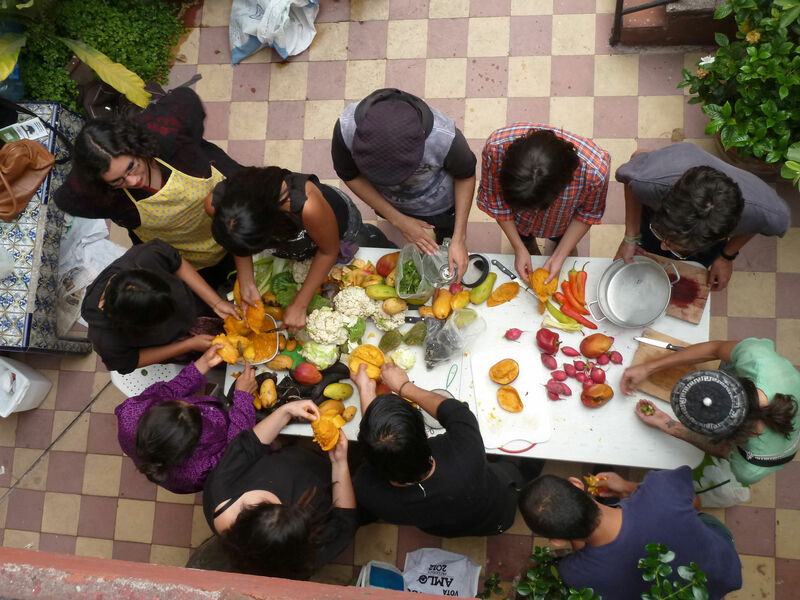 Members of Comida, No Bombas prepare a meal in Mexico City. Photo by author. Well, they call it “Comida, No Bombas” here. According to Pako, or Pako le Punk, to be precise, there are three chapters of Comida, No Bombas in Mexico City. The one in Iztapalapa, a poor neighborhood in the eastern part of town, has been around for eight years. “They were collecting food long before that, though,” Pako tells me. “For their own consumption.” Pako helped start the chapter in the southern part of town just over a year ago, and there is another one in north-central Mexico City. Food Not Bombs recovers and shares free vegan or vegetarian food with the public without restriction in over 1,000 cities around the world to protest war, poverty and the destruction of the environment. Each group is independent and invites everyone to participate in making decisions for their local chapter using the consensus process. Food Not Bombs is dedicated to taking nonviolent direct action to change society so no one is forced to stand in line to eat at a soup kitchen, expressing a commitment to the fact that food is a right and not a privilege. With over a billion people going hungry each day how can we spend another dollar on war? It was founded thirty years ago in the midst of the Seabrook Anti-Nuclear movement in Massachusetts, and has a strong history in the San Francisco Bay Area. I hadn’t realized that the organization had become as international as it has. Looking at their timeline of events, actions by Food Not Bombs chapters in countries other than the US begin to appear in the early 2000s. 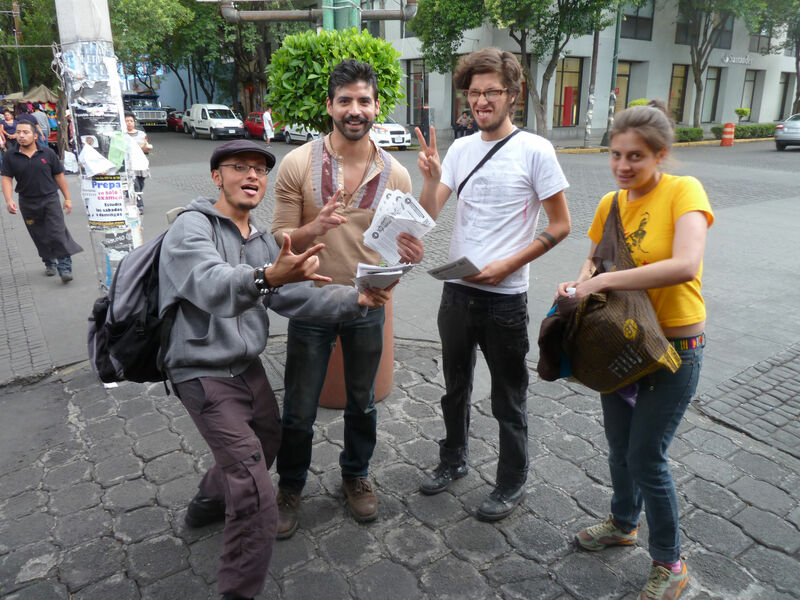 Finding out about the local Mexico City chapter was quite the surprise. Collecting food in Coyoacán Market. Photo by author. Food Not Bombs brings attention to an unfortunate gap – the gap between the time when food is no longer fresh enough to turn sell, and the time when it is no longer fresh enough to eat. Many vendors throw out this food, despite its edibility. That’s where Food Not Bombs gets its ingredients. In the US, this often means that members develop agreements or connections with a grocery store, bakery, restaurant, or the likes. In Mexico, it means going to markets–large warehouse-type buildings full of stalls with everything you can imagine… and it’s a lot of fun. 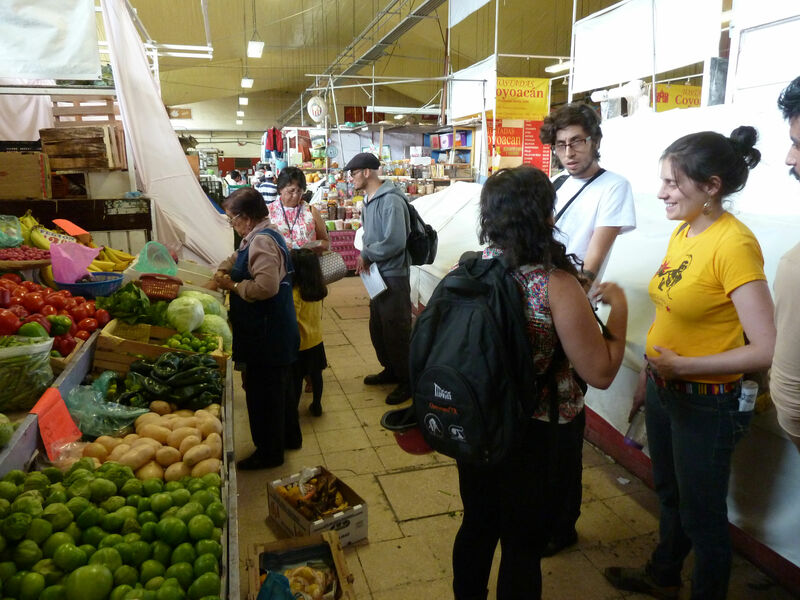 Paula, another friend, Luis, and I exited the Metro at Chilpancingo station and headed for Medellín Market. On this occasion we caught the Food Not Bombs crew just as they were finishing up their rounds. But they had a good fetch of mangoes, bananas, squash, beets, cauliflower, some peppers that turned out to be extremely spicy (I can attest to that) and a bunch of other fruits and vegetables that were colorful, if slightly soft or bruised. The next task was to cook all the grub, so we hauled it over to a community space near Metro Normal. While we chopped and chatted, I found a subculture that I hadn’t been around since I left San Francisco – punks and vegans. It takes dedication to be a vegan in Mexico City, to say the least. This was fascinating to me, but our conversation mostly turned towards politics and social justice – that’s why Paula and I were there. 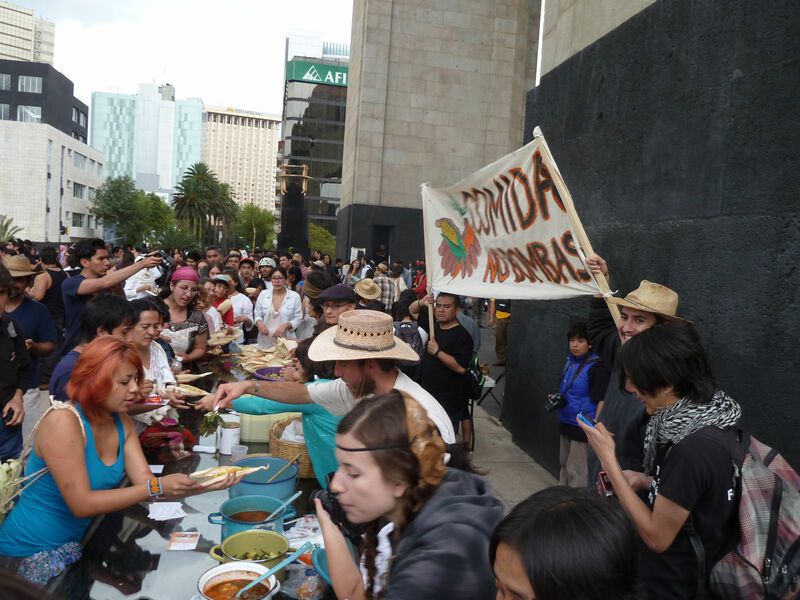 Paula had contacted the Comida, No Bombas group because she was helping organize the Mexico City event for the global March Against Monsanto, which took place in over 400 cities last Saturday, May 25th. The Carnaval del Maíz, (Carnival of Corn), as it was called, seemed like a great action for Comida, No Bombas to get involved in. After all, the March Against Monsanto has a lot to do with food. The day’s catch. Photo by author. I think that the political atmosphere in Mexico right now gives Comida, No Bombas a lot of relevance. 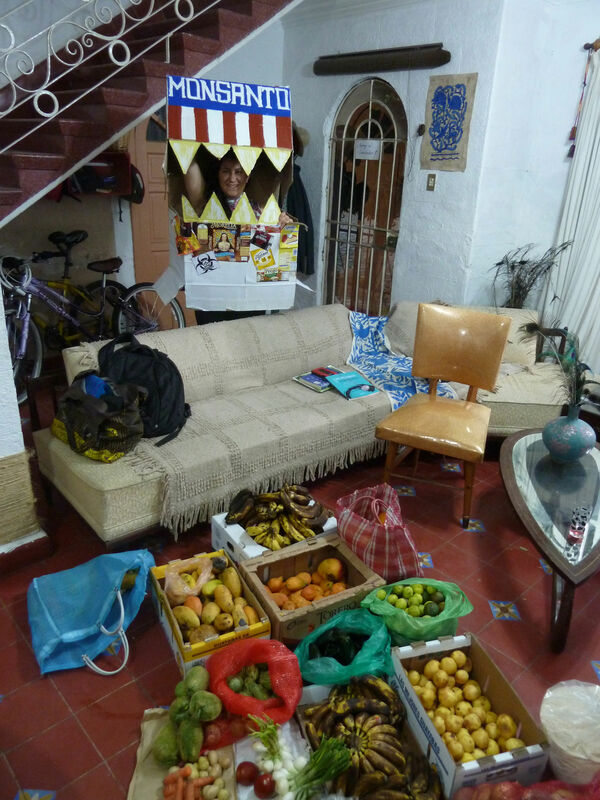 Agro-industry and transnational food corporations are playing a huge role in the dismantling of Mexico’s traditional food production system in the countryside. More and more food is imported, and Mexico’s agricultural heritage and diversity is at risk due to the pressure on small farmers to sell their land and move to the city or to the US. The Mexican government’s recently launched “Crusade on Hunger” changes very little other than rhetoric. The past and current administrations in Mexico have allocated very small amounts of funding to support the communities that have traditionally provided food for the population, and very large amounts of funding to militarize its borders and war on drugs. Bombs, not food. 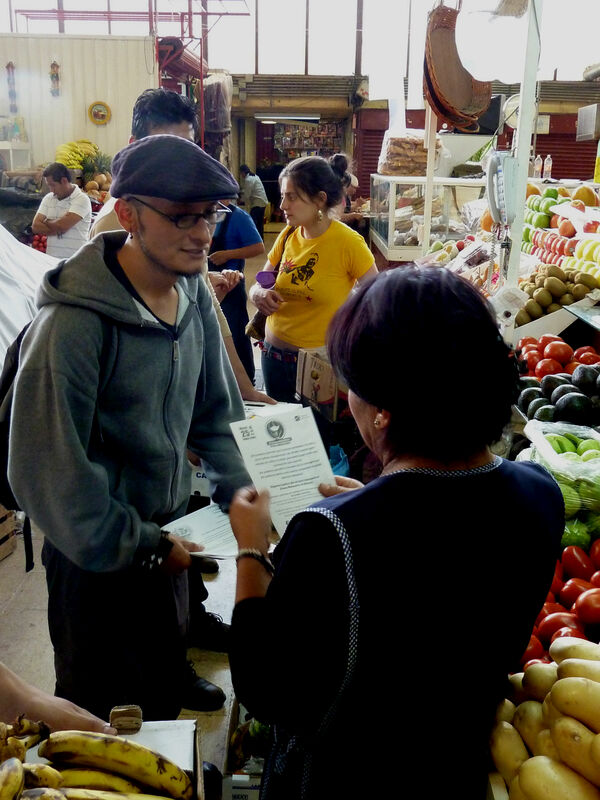 Meeting outside Coyoacán Market to collect food. Photo by author. The Comida, No Bombas group was thrilled to learn about the Carnival of Corn, particularly Pako le Punk. So on the day before the protest I found myself in the Mercado de Coyoacán for the collection, and this time I showed up early. Mexican markets are fun even when you’re just looking or buying. Loading up bags with whatever interesting produce happens to be getting overripe is a blast. I’ve never carried so many mangoes in my life. Pako shares a flyer for the Carnaval del Maíz with a vendor. Photo by author. Back at the house, while we peeled mangoes like crazy, I was struck again at the contrast between the Comida, No Bombas crowd and average Mexicans. 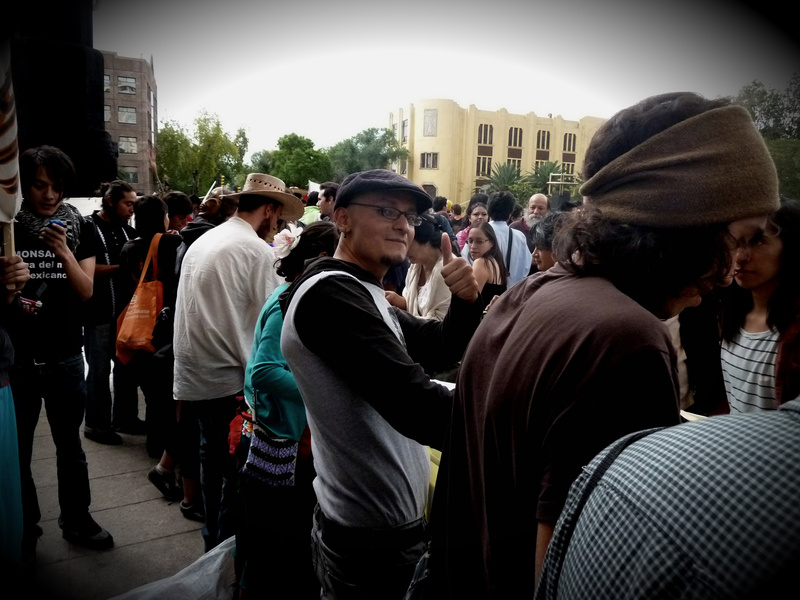 Or perhaps I was struck by the similarity between the Comida, No Bombas crowd in Mexico City and the Food Not Bombs crowd back home in the US. I couldn’t help but see this little nitch of subculture as largely adopted from Mexico’s northern neighbor. I was curious about this, and got pieces of the answer from both Pako and from articles about other Comida, No Bombas participants online. When I asked Pako why he thought it was that Mexico hadn’t developed its own separate Food Not Bombs-esque movement, his answer surprised me. In 1968, a student movement in Mexico was protesting the government’s enormous Olympic Games expenditures in the face of severely underfunded social programs. The movement grew, until it suffered viciously brutal repression by the government. So brutal, Pako considers, that the growth of social movements in Mexico was stunted for decades. He believes that has a lot to do with why many social efforts developed in the US and not in Mexico. Comida, No Bombas supports the Carnaval del Maíz. Photo by author. It was also interesting to read about Marissa, another Comida, No Bombas member, in an article by Luis Gabriel Urquieta. When I saw that Marissa had learned about Food Not Bombs while studying film in New York, I thought “aha! It’s got everything to do with having been to the US.” But Pako’s case doesn’t really reflect that, and then I saw that my observation had already been addressed. What Marissa said surprised me, though perhaps it shouldn’t have. The Mexican government has declared war on narcotrafficking because it considers drugs a public health problem, while in reality the biggest public health problems come from poor nutrition: diabetes and obesity. So what we’re saying is that attention should be focused on food that is healthy and accessible for everyone. When I read that, I couldn’t help but feel that my quest to expose the influences of the USA on Latin American had been somewhat disarmed. Not everything that starts in the US and ends up elsewhere is an example of cultural imperialism. It’s certainly worth suggesting that people in the US pay more attention to social movements abroad that are worth emulating. But rather than expand on that critique, I think I’ll just admire the beauty of a global, cooperative effort to make the world a little bit better.